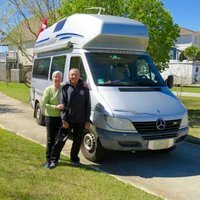 Retired couple searching for a simpler life in our Westfalia-Sprinter van. Completed 2 year/8 month journey around North America (plus 2 months in New Zealand in rented van) in June 2016. Various length adventures since then. Travel blogs: www.travelswithharvy.com and www.travelswithharvy2.wordpress.com. Happy to welcome visitors. Having been guests with several other BW hosts we understand what visitors need. Local knowledge for outdoor and tourist activities. Any quiet place with nice hosts. We've visited many and appreciate all who welcome travelers to share their space. Self-contained Sprinter based Westfalia conversion campervan. Easy going and a fun couple with a wealth of experience with their travels and adventures. Look forward to following along on their travels. It was a pleasure spending what little time I got to visit with these folks. Very knowledgeable and willing to share their knowledge about their travels! Great stories of all their travels across the US and more. This is what Boondocking is all about. Meeting and making new friends. Would love to see these folks again anytime. Will definitely follow their blog. Happy Trails! 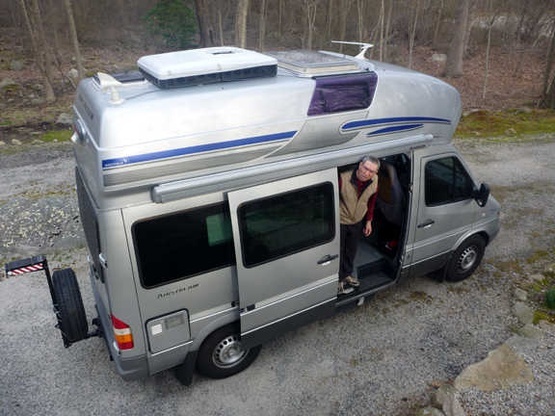 Fun couple with a wealth of knowledge on boondocking and Sprinter systems! Really enjoyed their stay. Good people to have staying with us. Discussed our upcoming trip and they politely suggested an alternative route. Nice couple, enjoyed visiting with them. Wonderful and well traveled couple. Very nice and professional message they left me, which prompted me to welcome them when I normally cannot accommodate last minute travelers. Glad I did. They're great! We had a great visit. It is always interesting to meet Rvers with a similar rig, especially when they come from a state we have not visited. We hope to reconnect in their home base. I had a wonderful time hosting these two at my oasis. Great conversations and so very friendly. I hope to see them again, soon. Safe Travels my friends. Enjoyed hosting this lovely couple for one night in our newly expanded boondocking pad we just had poured. They were gracious enough to give us the grand tour of their " Westy " and we loved it! They are very well travelled and we aspire to be as "wanderful" as them one day. Hoping to meet up again at their place in the fall on our way to the Atlantic Provinces. We would not hesitate to host them again. Good people. they have returned! it's their second visit to my home and it was so nice to have them as my guests. I did not get to "visit" with them as I had a busy schedule and they were sightseeing my town....a pretty cool couple and always welcome here. A really nice couple. I am sure you will be happy to have them as guests. Sunny27 in their small motorhome stayed with us for a few days in December. They are friendly and interesting. Being well traveled and an excellent photographer they had wonderful photos that they shared with us. We had several guest at that time and they fit right in. They are polite and appreciative. We recommend them as guest. Sunny27 stayed with us for several days in December 2016. Very nice couple. They are welcome back anytime. Met this couple early in December. They we're our first boondocker. Very nice couple with good conversation and attitude...I recommend them to anyone upon wich they happen to drop by...good people.. They only stayed one night but I would welcomed them to stay longer if they wished! They visited our downtown and waterfront area with my granddaughter and me to see our town Christmas tree lighting event....they are most welcome anytime...pleasant and friendly. We had a good visit with these folks. They are good conversationalists and are well- travelled. We swapped a few stories. They are welcome any time. Have a great trip, come back to our place any time and stay a little longer. We highly recommend Sunny27 to stay as your guest. These are interesting folks and easy to have around. I would recommend accepting their boondocking request. 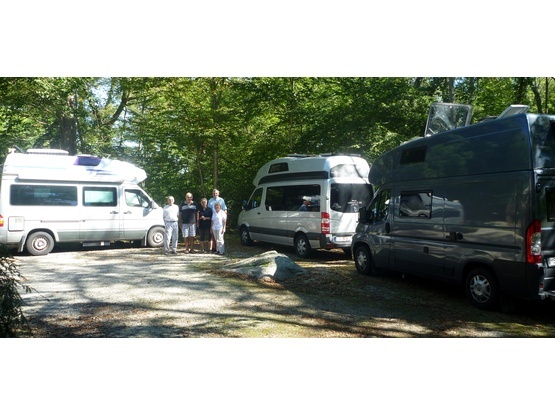 A great, quiet couple with a wealth of knowledge and experience about RV traveling! I would welcome them back any time. Great spot, our hosts were very helpful and generous with their time. I was travelling through Rhode Island and needed a quick stop to sleep for the night. The hosts replied the same day and welcomed me for the night. They also offered my their washer and dryer for a load of well needed laundry. I would definitely recommend and stay here again! A quiet & serene spot. We had had a long day driving and were so excited to see what a wonderful spot Sunny (Leslie) and Al's house in the woods was. Not only was it a quiet and beautiful but Leslie and Al were very gracious hosts. They shared tips on their travels and what we should see, let us tour their camper van but the best part was how comfortable they made us feel. Thank you for the wonderful stay! We look forward to returning the favor in California! Had a wonderful stay! They were helpful and knowledgeable. Can’t wait to stay here again! very friendly lent us a lot of information pamphlets so we could see what was in the area, out to assist us with where to park and see that we got hooked up. very knowledgeable about the surrounding area and sites. What a friendly and knowledgeable couple...they even have a blog regarding their travels. If you need to know interesting places to visit in the area then they're the people to ask. Al's always got several projects on the go but still put himself out to try and diagnose an electrical issue with my camper. However be carefull! He'll have you up on the roof cleaning gutters if you're timing's wrong....&lt;emoji&gt;&lt;emoji&gt;. Nice quiet camp spot with your own grassed area and friendly helpful hosts......what more could you ask. I hope we can catch up with them in the future. Sunny27 couldn't have been more welcoming and kind - helping me to back in (I'm not elegant with this skill yet) and getting settled. What a wonderful setting they have. Such fun to watch her feed their fish and listen to the birds in their beautiful little nature habitat. Thanks again for sharing your travel adventures and hosting me. Best wishes in your future travel plans. Nice and quiet area with easy access for our trailer. They were quick to get power out for us, lent a hand with a quick lubrication for our stabilizers and even took out trash! This was our first time using Boondockers Welcome and if all our hosts are similar, we will be very satisfied. We would definitely recommend.